Today I had the joy of seeing another child's joy in quilting begin. 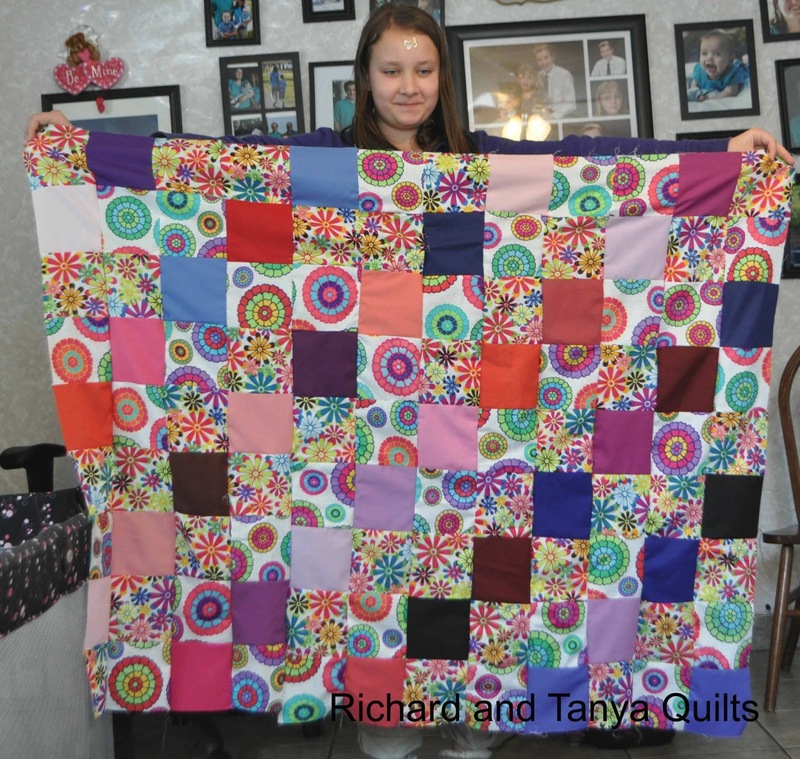 Last week we gave her family a quilt to thank then for all the wonderful kind things they have done for us. 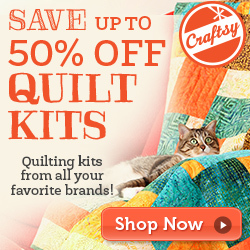 When we were there, she commented that she wanted to learn how to quilt. So last Saturday we invited her over and let her chose material from out stash to make a quilt. She picked the wild flowers that Rebecca picked out and to help tone it down some Tanya added some 5 inch solid squares she won some where in blog land. 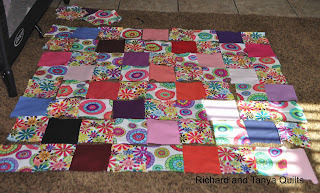 I started out by cutting up the fabric that she picked into 5 inch blocks to match the solids that Tanya added to our mix. 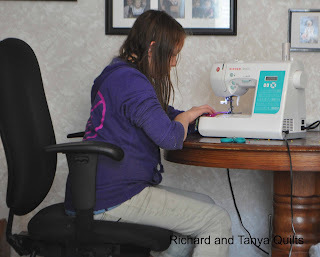 I had her line up the first 4 rows first, before we started to sew. The above picture was taken half way though. 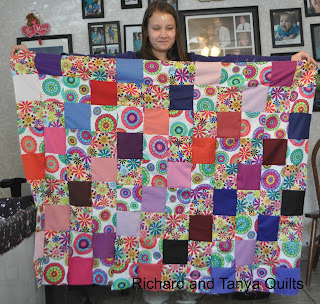 The quilt top ended up 9 blocks wide by 12 blocks long. 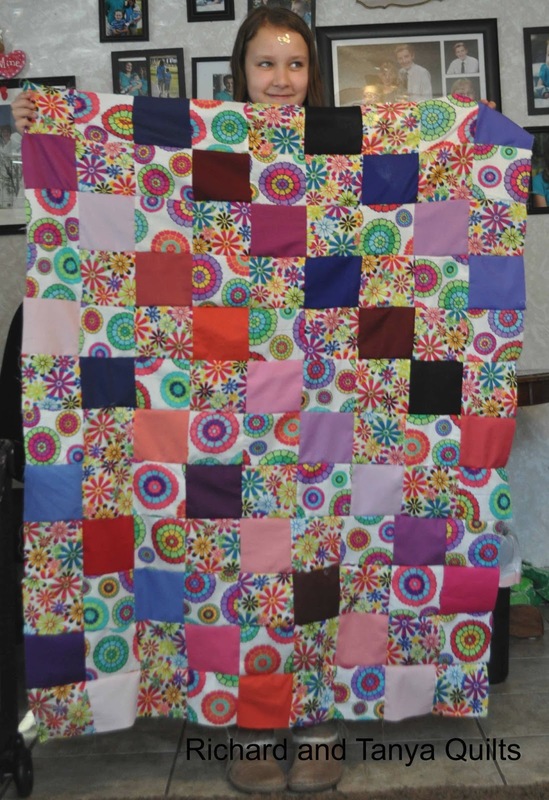 She was a total natural at the piecing. I showed her how to pick up and keep track of the blocks she was sewing and then showed her how to keep putting it back together. I taught her how to chain piece and was impressed with her speed and skill at doing it. In just 4 or so hours we were able to get the top pieced. That is so great. 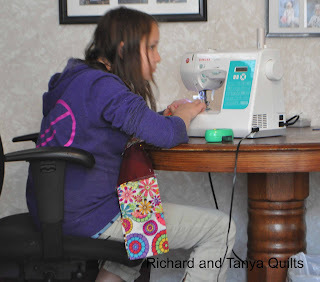 Isn't it fun to teach someone to start quilting.